I like to think about the other people who have used the same glass as me at any given restaurant. Not in an OCD-germy way but as a thought experiment. The man who drank orange Fanta out of this chipped glass: what are his hopes and dreams? What is he doing right now? What is his favorite place in the world? And every other person: where are they all right at this moment? Similarly, I’ve started to think about the public places where I linger. Who has sat, who has stood, who has leaned here before? There are all kinds of things out there in this world just ready to be leaned on. When you’re physically tired and you can't do the weight-on-one-leg/hip-out thing anymore, it’s just right to lean on an object. Desks. Chairs. Trees. Walls. Stoops. Railings. Stools. Sinks and counters. People. A large dog if you're a baby. Cars (unmoving). As leaning is the way and the key - the clave, the llave - this is a letter of Recommendation for Loitering and its overlooked benefits. 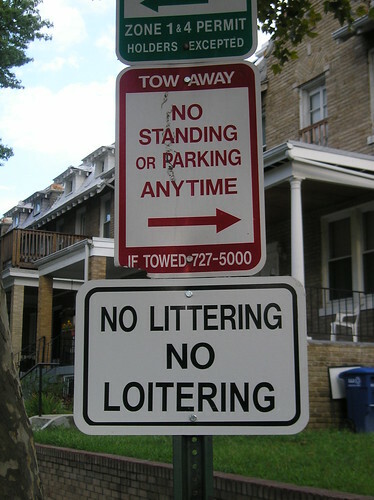 In the States, we’re told not to loiter, mostly from intimidating signs. Try to imagine a police officer actually saying to someone’s face, “Excuse me, Ma’am, please refrain from loitering.” It sounds hilarious. When I was but a young thing I thought people were just saying “littering” in a funny way. And littering is so much worse, no? So we are told from scary signs like this, not to loiter. That it’s shady and suspicious. That it scares the people who just want to go into Barnes & Noble and buy a bookend or two or a small desk gong without any trouble. I think it’s a little self-important for anti-loitering officials (if they even exist much less under any sort of formal title) to assume we want to loiter in one public space for ages and ages. In the grandest sense, aren’t we all just passing through? Loitering is best when you are not holding anything. This will be strange at first, because you will want to cross your arms five different ways. This is why I think it’s meditative: you have to forget about what your body language says about you to other people. Personally, I had to part ways with every single magazine article about body language that had crept into my subconscious. Now, I can loiter freely and probably awkwardly but a whole burden is lifted! Linger as a pup. I personally look to the stray dogs for inspiration, for they are the masters of loitering. I don’t go so far as to poop in the street on the regular, but whenever I see a dog panting heavily with its snout turned up and its eyes closed in the sunny spot of the park I think: that dog has got it. A common practice of the very best loiterers is leaning. The act of leaning has a remarkable way of alleviating those pesky daily burdens of the body and spirit, of the physical and the emotional. Realizing that it’s totally OK, even necessary, to lean over, into, or onto anything and everything that’s around you is also something Bill Withers expertly identified in song. When I am physically tired, I follow the form of Correntinos around me and lean on a retaining wall or building or a tree. When I’m emotionally tired, I probably too often look to my cell phone - to take notes about what to buy for dinner or to Like a photo of some succulents on Instagram. If my self-control is just so or if my phone is out of battery and stowed away, I look around me at the other people, the babies, the dogs, the man at the gas station mopping the oily pavement - to my eternal confusion - the same time that he does every day. No one can loiter for too much time without leaning. And I've gotten so good at doing it naturally that people assume my hair is dyed blonde and ask me for basic directions. And of course, eventually you have to keep walking. But what’s nice about it all is that once I do keep walking, I find myself looking around with a greater tenderness and, hopefully, gentleness. So, who has loitered here, in Corrientes, before me? And who will loiter after me? I will never know and the magic of it overwhelms me in the very best way.